The ibis hotel in Molins del Rei is ideal whether traveling for business or leisure. Located close to the highway, 9.3 miles (15 km) from Barcelona-El Prat Airport and less than 6.2 miles (10 km) from the center of Barcelona and the Camp Nou soccer stadiu m. All of the comfortable rooms feature air conditioning, heating, TV and WIFI. Restaurant, 24-hour bar/snacks, parking and a meeting room with natural light and capacity for 70 people. 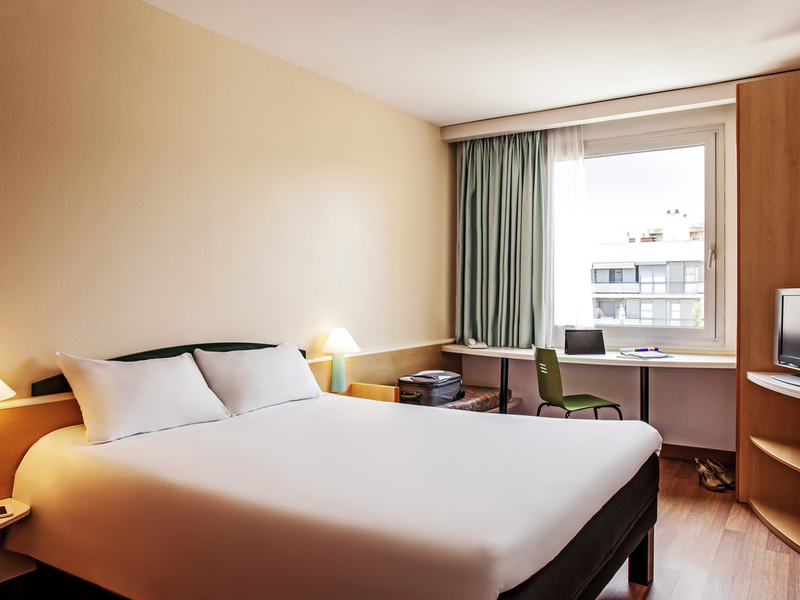 Reserve a room at our ibis hotel in Molins del Rei Barcelona! 6.2 miles from Barcelona and the airport. Un personal amable, educado . Una estancia agradable. It was ok for a standard lower end hotel. I thought that the bathroom was small and cramped and the biggest weakness was the breakfast. There was no eggs at breakfast and very limited selection to eat other than bread and cereal. Employees are very nice and customer-oriented. The little things that make the difference. My couple and I stayed at the hotel because of a wedding we attended. The hotel is cca 15min on foot from the train station. There are some cafes and bars nearby. The room was spacious enough for the weekend. It was clean and had all the necessary things. The tap water tasted a bit weird. The check-in/ check-out was quick and the girl at the reception was friendly. Everything was great! Friendly staff, great service!! We were making a brief stop in Barcelona to visit family so we were looking for an Ibis hotel between the airport and the city centre. Surprisingly the two most suitable were not available so we opted for Molins de Rei, taking a taxi from the airport. We were welcomed on arrival by Lorena who had been able to respond in advance to a personal request in our booking. We had an excellent dinner served patiently by Susana and slept very well. The same taxi driver as the previous day took us into the city centre. Perhaps the only negative factor of the hotel is the lack of suitable public transport. Check-in was done very quickly and the staff were very helpful. Staff at breakfast in the morning were less friendly and the options at breakfast aren’t that great. Good service and reasonabke price.